From Zermatt station it takes less than 10 minutes on foot to the Cervo. From the valley station of the Sunnegga funicular the lift takes you directly to reception. And in reverse directly to the funicular and on to the slopes. In December 2009, Seraina and Daniel F. Lauber celebrated becoming hosts of their own hotel and restaurant in a dream location with view of the Matterhorn. Already in the first year the Cervo got people talking and satisfied guests praised the stylish and fashionable hotel. Cervo recently won Tripadvisor’s Travellers‘ Choice Award! The view alone of the Matterhorn is simply sensational. The scenic location between the edge of the forest and the outskirts of the village is unique and radiates rest and relaxation. The new hotel consists of six chalets including the owner's lodge, with spacious rooms and suites. All contain a private wellness room for the exclusive use of hotel guests in their respective chalets. All chalets are easily accessible by lift and a footpath. The distinctive design creates a balance between Alpine chalet, mountain hut and hunting lodge, with just the right amount of modernity. The architecture incorporates the special characteristics of this unique setting on the edge of the forest. The Cervo is the creation of the MLS architectural bureau in Zermatt under the direction of Roman Mooser and interior designer Roger Bächtold with his P.5 team from Zurich. Our prices are quoted per person based on two people sharing a Cosy Deluxe Room including a sumptuous breakfast buffet, service and VAT. Other room types available on request. Please note two week minimum booking period over Christmas & New Year. To experience a moment together with family or friends is something special we suggest choosing your favourite chalet and booking it entirely for yourselves. Each with 4 Deluxe Rooms sleeping up to 10 people, from 32 to 37m² area. Breakfast can be served in your room, suite or in the restaurant. 240m² of well-being, a chalet to be booked exclusively for family or a group of friends. 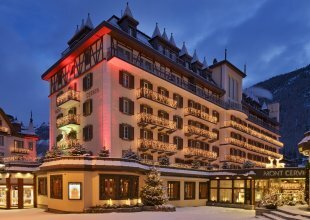 Zermatt - The Disneyland of Ski Resorts!